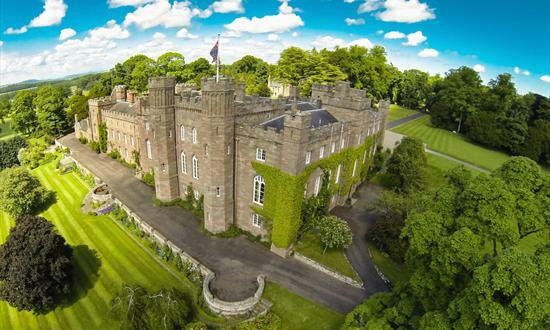 Scone breathes history like nowhere else in Scotland. It is the family home of the Earls of Mansfield and the ancient crowning place of Scottish kings on the stone of Scone. See where the Stone of Scone, known as the Stone of Destiny, once stood. It now resides in Edinburgh Castle. You can wander down the Long Galley where King Charles II strode to his coronation in 1661. During the Jacobite rebellions, the ‘Old Pretender’ spent three weeks at Scone while his son, Bonnie Prince Charlie, visited in 1745. Admire the needlework skills of Mary Queen of Scots bedhangings that she worked on while in prison on Loch Leven. Discover the desk at which Frances' tragic young Queen, Marie Antionette, wrote her letters prior to the days when the guillotine beckoned. You can also see the State Rooms where Queen Victoria was entertained on her way to the Highlands in 1842, and the bedroom in which she slept. If you are a lover of fine things, Scone is a treasury of furniture and paintings, porcelain and other objets d'art. Scone Palace is surrounded by beautiful gardens and peaceful woodland, perfect for a gentle stroll or even a picnic - all under the watchful eye of the ever curious peacocks. There's a great adventure playground for children, not to mention the unique 'tartan' maze of 2,000 beech trees half green, half copper, designed by the world-famous Adrian Fisher. The maze was planted in the shape of the heraldic Murray Star.